I'm not that much of a tech guy, but I really appreciate super much and respect you guys for sharing all that knowledge here and moreover developing your studies. Once more I think you should reach out with your findings to the team so the shader that (I hope) is being developed will be as good as it can be. A question Fluss - lets say we have a very long and narrow room with a window on one end. Does what you imply - that Corona does a poor job at maintaining the energy conservation rule - mean that it will be darker at the other side of the room than let's say in Fstorm (of course with the same camera exposure etc.) ? Wait, so this happens not only for refraction but reflection, too? Heck, it almost hurts physically. I wish we could settle the BRDF shortcomings for good rather sooner than later. Dubcat has a website??? where??! 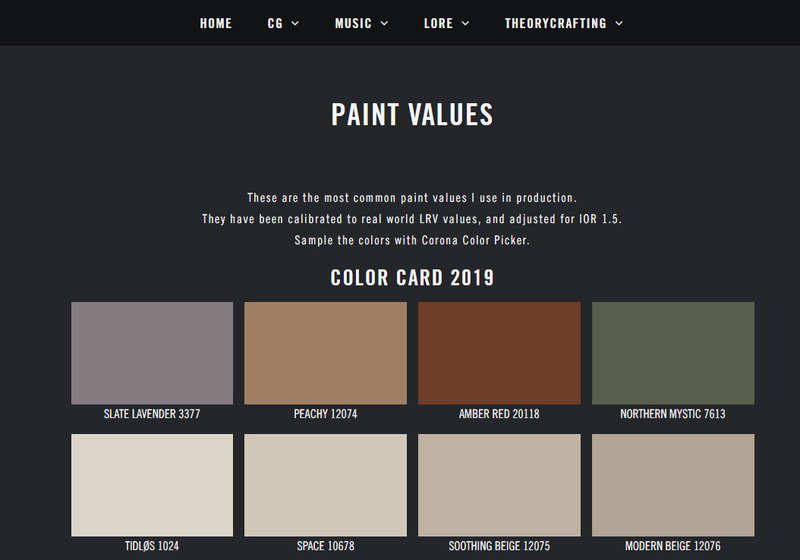 "I have a whole page dedicated to factory paints on my new site (still in beta),"
Do you have a link to your site perhaps? There are still a couple of pages I need to write before the site goes public. Here is a little preview of the calibrated paint page. It's one thing to calibrate swatches to real world LRV, but the most important step is to remove IOR. IOR really de-saturates colors (If they are middle dark++). Everyone will notice this the first time they cross specular scan something. LRV = Value in Corona Color Picker and this value is linear. It's just plain stupid that the "sRGB" check box does not affect Value in "Corona Color Picker" yet. Maybe you could reach out to the team ? Ondra and the dev team have direct contact to me, so if they ever need anything they know I'll be there. Basically you're asking a slot to input cross polarized specular scan in order to modify the microfacets distribution, is that right? I want to merge Glossiness/Roughness and IOR/Specular into one map (aka Roughness/Glossiness, it will not degrade the current real world scanned material PBR system in anyway, only improve it). Because we are already 50% there. The lower pbr glossiness value we use, the lower the IOR gets, but this is a global change. 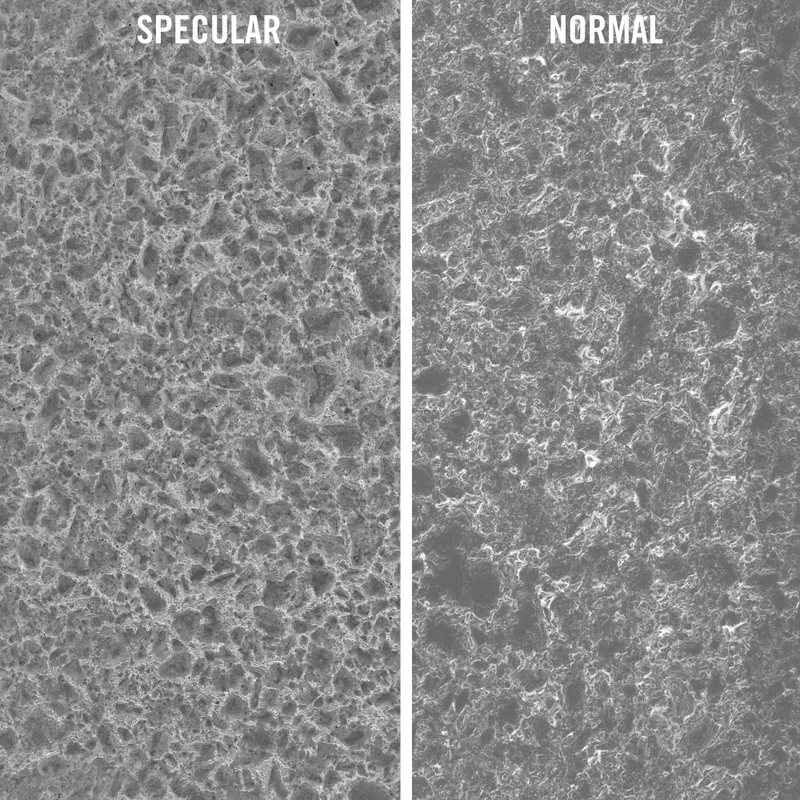 The glossiness IOR change does not go above or bellow the initial value (If we use asphalt as an example, it does not respect gem stones in the scan, or micro shadows. Micro shadowing is the #1 error that has to be fixed in CGI imho beside Coronas diffuse roughness ( ͡° ͜ʖ ͡°) ), but kinda act like reflection level did before pbr. Like when you change the opacity of a layer in Photoshop. I made a quick and dirty proof of concept material for you guys, to show what I mean. I don't know if the Corona Curve settings get saved with the material preset, I guess so. But just in case, here is the curve. 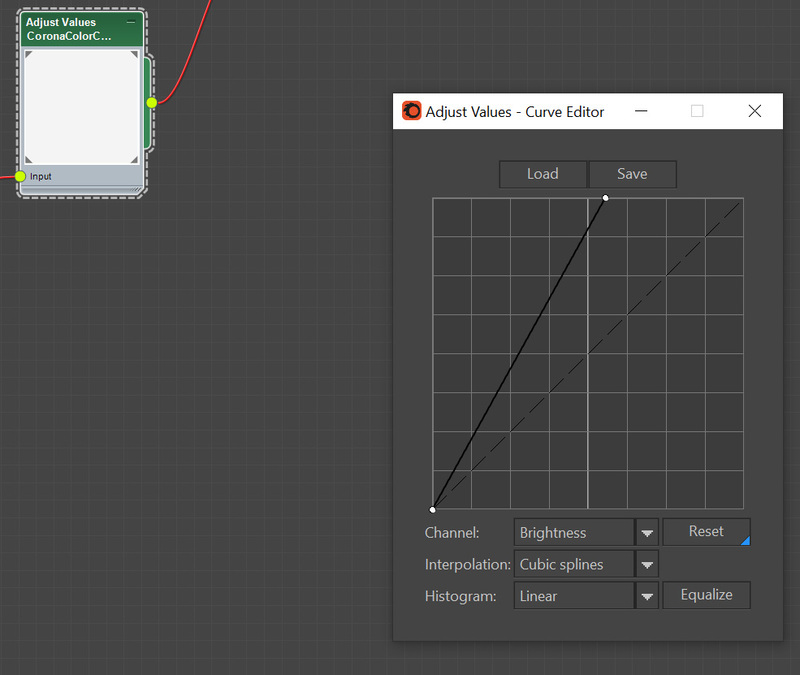 We really need X/Y value inputs in Corona Curve! edit: Fixed a mistake in the material. I also want to mention that the super blurred texture in the "High Pass" section has to be Corona Bitmap with 9999999442119689768320106496 Blur value. 3dsmax bitmap can't blur this much. We really need a "gaussian blur" function in one of the Corona maps, I made a request on mantis a year or so ago. This feature is the only thing that is halting my mask generator, because we have to gaussian blur procedural maps. "perform mixing in sRGB space" checkbox is unticked. Do you have any insight about that? I tried 2 multiplied with 0.75 and 1 pluss 0.5 and they seemed to give me 4% IOR. I used the latest Daily Build. 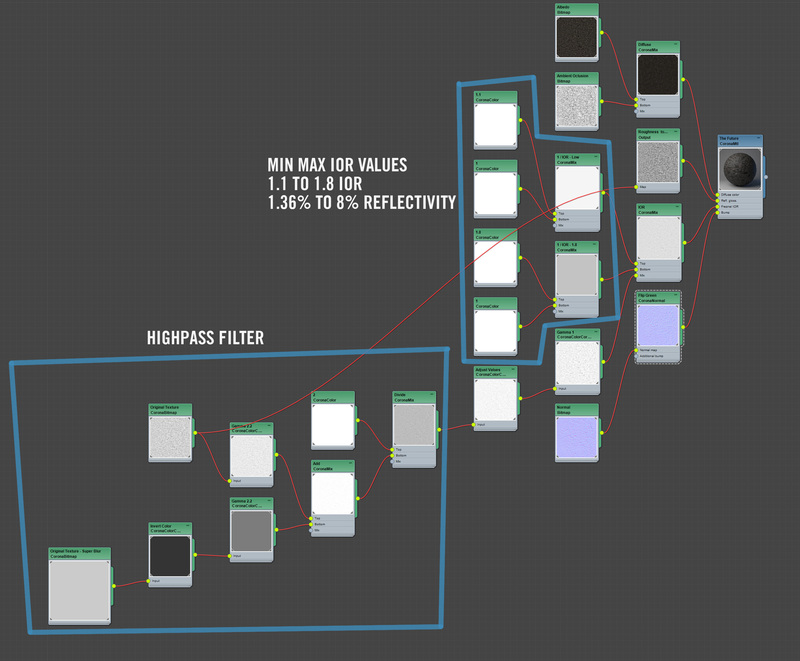 I use the 1/IOR method in my Substance Designer generator since my maps will work in multiple render engines. This proof of concept was based on that generator. For people who are reading this later, feel free to simplify the material with pure float values as Fluss mentioned. When I generate my IOR maps with my Substance Designer generator, it takes into account the global PBR IOR reduction (glossines value). So it only enhances the micro shadows or gem stones in the material. If a 4% flat material has 3% because of the PBR glossiness, it will still be 3% when you use the IOR map. This is something Corona could do behind the scenes, since they know what IOR and Glossiness value we are using in the material. Finally, as you said, Micro shadowing most of the time overlooked. Bump/Normal to IOR is kind of inferior to "Cross Polarizing" to IOR. Since it is only height based and not specular, (while Cross Polarizing also takes height into account, if we use scanned data), but I would not say no to a height based feature in our current state. Megascans official specular maps are generated from normal maps, and they kinda have this flat plastic feel that you are talking about (I always associate this feel with Elder Scrolls Oblivion). The next major Quixel Bridge update will include my Roughness to IOR LUT + my latest script for Corona (Metal and Fabric support). Corona is the only engine that support all this stuff, because we have devs that actually listen to user requests. Here is an example from my generator with roughness and normal map as input, you can see the plastic feeling you get from normal maps (height to IOR). I generate all my maps in Substance Designer, this was only a quick port to 3dsMax as a proof of concept. Maybe Corona Curve map has the same issues as the LUT map had before ? I hope not :( I can do some tests later this week, if you don't want to. I've added a Photoshop action script that convert normal maps to height info. You can then plug this into the highpass chain in my proof of concept material. How do you have such knowledge of the technical aspects of lighting and shading? Id like to have a deeper understanding of it and wondered if you could recommend any resources? Im warming to the idea of being a Lighting/Shading TD at some point in my career as i really enjoy the technical side of the industry. Any recommendations would be very much appreciated!